Very good condition 30” barrels. Comes with full set of optima chokes. 1 Teague 3/8 choke. This gun is only 3 months old. Brand new, boxed, had 20 shots fired only on test. Beautiful gun, unused gift ! Bought only few months ago. Beretta 680 trap gun. 29 1/2" barrels, multichoke (Colonial Arms thinwall), 2 3/4" chambers. Fitted with Pachmeyer quick release pads ( 2 supplied ). Good working condition for it's age (1980). Action still firm. As new un-marked condition. With 3 chokes, makers plastic case and all original accessories. A lovely sporter example with very nice figuring on the wood. Has a full set of 8 extended chokes. Comes in the Beretta motor case. Nice example been re blacked,complete with 5 chokes. A stunning gun with really nice figuring on the wood. Comes in the Beretta motor case with 5 chokes & paperwork. EXCELLENT CONDITION GAMESCENE BERETTA SO6 EELL. HAS SHOT VERY LITTLE, STILL TIGHT IN THE ACTION. 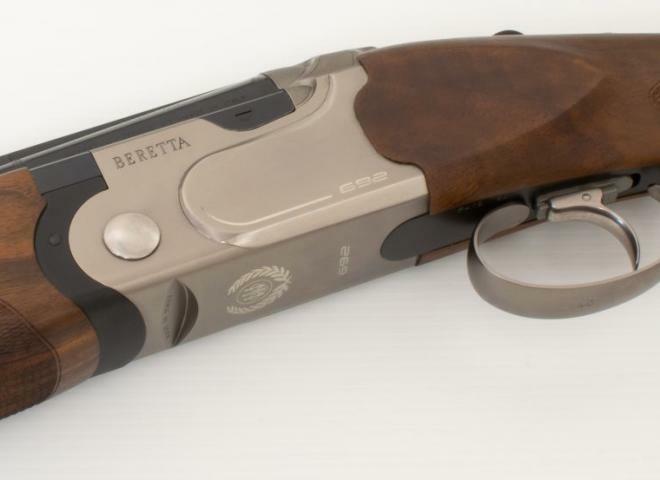 A rare high grade Semi auto from Beretta. Very nice quality wood, Gamescene engraving with gold inlay. The ever popular silver pigeon 1 sport, featuring optima HP choking system. Fantastic reliable gun, comes with chokes and key. Very good condition well looked after, a few minor marks on the stock. Reluctant sale due to the fact I use a side by side more now. New, Cased With 5 Chokes & Key.